There are different kinds of maps, that serve different purposes. for example, in order to drive from Point A to Point B, a regular road map will be useful. But once you've strayed from the road, perhaps on a backpacking trek or hike, you will need to use the terrain and the contours of the land as reference, meaning that you need to be able to read a topographic map. What's the difference between a topographic map and a regular map? basically, topographic maps allow you to see a three-dimensional landscape on a two-dimensional surface, using the concept of Contour Lines. Width between contour lines indicates the steepness of a terrain. Contour lines connect points that share the same elevation, meaning you can walk (metaphorically) on one contour line and always stay on the same height. When contour lines are close together (they can never intersect), elevation is changing rapidly in short distance meaning the terrain is steep. When contour lines are wide apart, elevation is changing slowly, indicating a gentle slope. Learning how to read contour lines is an important skill to learn if you want to become a better hiker or backpacker. For example, when planning a hike, you can plan the path you plan to take and see whether it has hills or cliffs which is too difficult to climb. Contour lines are also important for navigation. During a hike, you can match the landscape around you to its corresponding contours lines on a map in order to keep track of where you are. Knowing how to use a compass or GPS is important, but it will not be much help if you cannot read the contour lines on a topographic map. Index lines: Some contour lines are thicker; those are the "index" lines. At some point along that line, its exact elevation is listed. Contour interval: The change in elevation from one contour line to the next is always the same within the same map. Many maps have either a 40- or 80-foot contour interval: An 80-foot interval simply means that each contour line is 80 vertical feet away from the next closest line. You find the contour interval for your map in its legend. Depression - A contour line with tick marks inside it indicates a depression, rather than a peak. You should also see elevations decreasing as you get near the depression. 1. Every point of the same contour line has the same elevation. 2. One side of a contour line is uphill and one is downhill. 3. Contour lines close to form a circle (or run off the side of the map). The area inside the circle is almost always higher than the contour line. 4. Contour lines are drawn close together on steep ground and farther apart on flat ground. Another thing to remember about a topographic maps is that north will always be at the top edge of the map. You might notice other maps shift north around in order to make the map fit better on the page. With topo maps, though, north will always be in the same place. The map's scale tells you how detailed your map is. For example, A 1:30,000 scale means one inch equals 30,000 inches in reality. A larger scale means that a map covers a larger area, but therefore will have less detail. For USGS topographic maps, 1:24,000 is the scale most often used. Maps based on metric units use a scale of 1:25,000, where one centimeter equals 0.25 kilometers. Before use, read closely the map's legend. Start by studying what each line, symbol and color means. Generally, green symbols vegetation (forests, fields) while blue represent water objects (streams, lakes). Darker colors mean denser vegetation, while light or colorless areas suggest open terrain. In order to improve, practice reading features from a map of a familiar area. Visualize how the terrain on the major landmarks relates to the contour lines you see on your map, Pick out features like peaks and passes & Identify the subtler features. If you can get in the habit of checking your map every time the elevation or landforms around you change, it becomes very easy to keep track of your location on a hike, regardless of where you are. Staying found like this and always knowing where you are can be done even if you don't know how to use a compass yet, and it's an important navigation skill to master for any hiker. GPS devices are great, but they can break, get lost, or easily be hampered by weather conditions, making basic map and compass skills essential for anyone who spends time outdoors. This popular, easy-to-use orienteering handbook has been helping people find their way for more than fifty years. Now updated to include information on GPS as well as current Web sites, references, sources, and photographs, it remains the book of choice for professional outdoorsmen, novice orienteers, and outdoor organizations as well as teachers, scout leaders, recreational hikers, hunters, and others around the world. 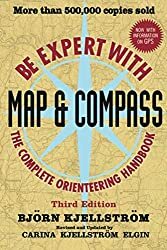 Coverage includes understanding map symbols; traveling by map alone, by compass alone, or by map and compass together; finding bearings; sketching maps; and traveling in the wilderness. If you're looking to feel more comfortable in the wilderness, this updated guide is an indispensable reference.